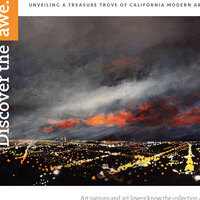 Take a deeper look at the First Glimpse: Introduction the Buck Collection exhibition on a complimentary gallery tour led by an Art History graduate student docent, who will discuss selected highlights in the context of the history of California art and the Buck Collection. UCI proudly offers a First Glimpse of The Buck Collection, part of the emerging Institute and Museum for California Art. Acquired by Newport Beach developer and eclectic collector Gerald Buck, the 3,300 artworks by California artists span a broad range of genres and media. This exhibition, held at the Claire Trevor School of the Arts, reveals just over fifty works of Abstract Classicism, Expressionism, Assemblage, California Funk, Light and Space, and those defying definition. The exhibition presents California as a crucible of creativity and its artists as pioneering new movements, altering historical courses, and following powerful individual vision.